For many people, storage management can be a tedious work, especially for those who have the 16 GB version of iPhone SE/6s/6. Recently, some iPhone users complained that it occupies the 6 GB space of its iPhones since updated to iOS 10, they must delete photos on their iPhone which is one of the biggest offenders for space storage. Unfortunately, they remove some precious photos on their iPhone accidentally. Now, Apple’s support forums filled with questions: How to recover deleted photos from iPhone SE/6s/6 on Mac 10.6 (loyal Apple users)? You cannot do anything but face the reality? It’s the end? Absolutely not! In this post, we will recommend an excellent data recovery software – Tenorshare iPhone Data Recovery for Mac that can help you recover deleted iPhone photos on Mac 10.6. Then we will show you the details on how to directly recover deleted photos on iPhone. Tenorshare iPhone Data Recovery for Mac is designed to provide iPhone users a method to recover the data from iPhone on Mac (Mac OS X 10.0 – macOS 10.12), regardless of whether they made the backup or not. Moreover, the software allows you to scan and recover data selectively, you can get what you want, instead of restoring your iPhone to a designated backup point. Step 1: Launch Tenorshare iPhone Data Recovery for Mac and connect your iPhone SE/6s/6 to the Mac with a USB cable, then click on “Start Scan”. Step 2: Choose Photos > Preview and select photos you want > Select data to recover on your computer or iPhone according to your need. Step 3: Once the recovery process is complete, you will see the full page. Within minutes, all the photos you have selected will be restored and saved on your computer / iPhone. So after reading this post, you should know how to retrieve deleted photos from iPhone on Mac OS 10.6. 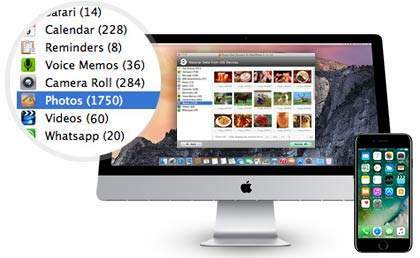 Absolutely, except the photos, Tenorshare iPhone Data Recovery for Mac can recover the other 19 types of files and data, including messages, videos, contacts, call history, reminders, notes, etc. Why not have a try now?